Full casting has been announced for the brand-new arena spectacular Heaven on Earth which will be touring arenas across the UK from December 2017 to May 2018. The greatest story ever written comes spectacularly to life in a brand new musical experience. 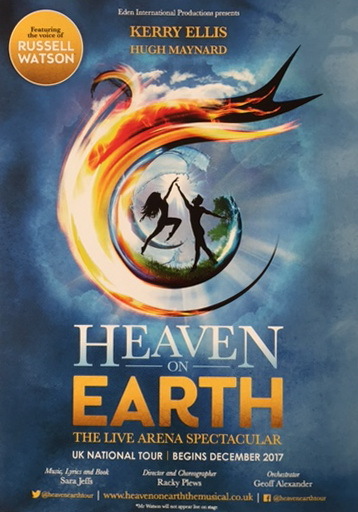 This epic and inspirational journey of Adam and Eve is told through state of the art digital technology, innovative staging and stunning choreography. Richard Carson as Enoch (Mamma Mia, Miss Saigon, Wicked), Lisa Bridge as Isla (Charlie and the Chocolate Factory, Bend It Like Beckham, Dirty Rotten Scoundrels), Neil Moors as Serpent, (Jesus Christ Superstar, Shrek, The Sound of Music), Denis Grindel as Cain (The Commitments), Michael Colbourne as Abel (Joseph and the Amazing Technicolor Dreamcoat, Les Miserables) and Albert Simon Hart as Young Enoch (Oliver). The ensemble includes:Alice Baker, Laura Benazaize, Tom Brandon, Charlie Bull, Carly Cook, Martin Dickinson, Mike Fellows, Taofique Folarin, Loula Geater, Richie Gooding, Kelly Hampson, Zoe Innes, Abbi Kennedy, Victoria Lamm, Nick Len, Adam Margilewski, Stephanie Rojas, Craig Ryder, Guy Salim, Hayley Ellen Scott, Spin, Sam Varley and Sharon Wattis. The creative team for the show includes director & choreographer Racky Plews - American Idiot (West End and Tour), Footloose (West End and Tour), Thoroughly Modern Millie (Tour), set designer Jacqueline Pyle - Robbie Williams (Take The Crown Tour), Olympic Opening and Closing Ceremony (UK), Take That (Progress Live Tour), and arranger Adam Langston – (Alien Covenant, Les Miserables, Independence Day Resurgence, Walking With Dinosaurs) and musical director Richard John – Sinatra (London Palladium), Dirty Rotten Scoundrels and Legally Blonde (Savoy Theatre).